By Detective Kevin Donovan, from Edith Maxwell's second Quaker Midwife Mystery, Called to Justice, out April 8 from Midnight Ink! My author, the esteemed Miss Maxwell, asked me to share a moment from the murder investigation of July, 1888, so here you be. And she's after sending one of you (in these United States of America only, I'm afraid) a copy of the book, so be sure you leave a comment of one sort or another. I stepped out the front door of the Amesbury police station the morning after the killing. I'm sure I looked rather worse for the wear, and when I saw Midwife Rose Carroll, I groaned. “Miss Carroll. I am not surprised to see you so bright and early this morn. I would have sent for you in any case. I’ve just been reading Officer Gilbert’s report.” Moisture beaded on my face, and the buttons on my high-collared uniform shirt strained uncomfortably over my more-than-adequate belly. “About Hannah Breed’s death.” I made a tsking sound. “You were there.” She and her doctor friend, Mr. Dodge, had been nearly first on the scene after young Miss Breed was shot dead during the Independence Day fireworks. I surveyed up and down the busy street. The horse-drawn trolley clattered by, filled with people on their way to the day’s work. A matched pair of chestnut mares pulled a graceful Bailey carriage, and a jay squawked from the tall swamp oak on the corner. I gestured to a bench on the bricked walkway. She gazed at me. "But thee is entertaining the thought that it might have been murder, not an accident. Thee must have reason to believe Hannah’s death might be homicide. But why?" Readers: What's your favorite transport from another era? What'd be your ideal method of getting around, past, present, or future? Remember, Miss Maxwell is giving away a copy of the brand new Rose Carroll mystery to one US reader who comments before midnight PDT tonight. Kirkus Reviews: "An intriguing look at life in 19th-century New England, a heroine whose goodness guides all her decisions, and a mystery that surprises." I would like to try a coach, but I hear they are uncomfortable. By horse.They are such beautiful animals.Though I am afraid I would need the good dr after I fell off. A dray most likely would be the best fit, a working man's vehicle, pulled by muscled draught horses. Love biking to get around past and present but only when the weather and terrain cooperates. A delightful glimpse at another time. Luxury trains----I think it would be so much fun to travel Europe like in the old days with fancy dining cars and private coaches. I would probably like a train. I think there is just something nostalgic about the old steam trains, the faster trains of today and the future such as maglev trains. My dream has always been a ride on the Orient Express. Thank you for the chance to win a copy of your book. I would love to read it! I would like to ride a train in the past and present. In the future I would like o hover car. I would definitely choose a train ride, with those large windows to watch the beautiful scenery go by. I would like to get around in a horse drawn carriage. There is something about that time period that fascinates me. Congrats on your two new book releases. I think it would be interesting to travel, even if just once, by the Quick Silver Royal Mail Coach. I read about it in at least one other book, and it quite fascinated me. 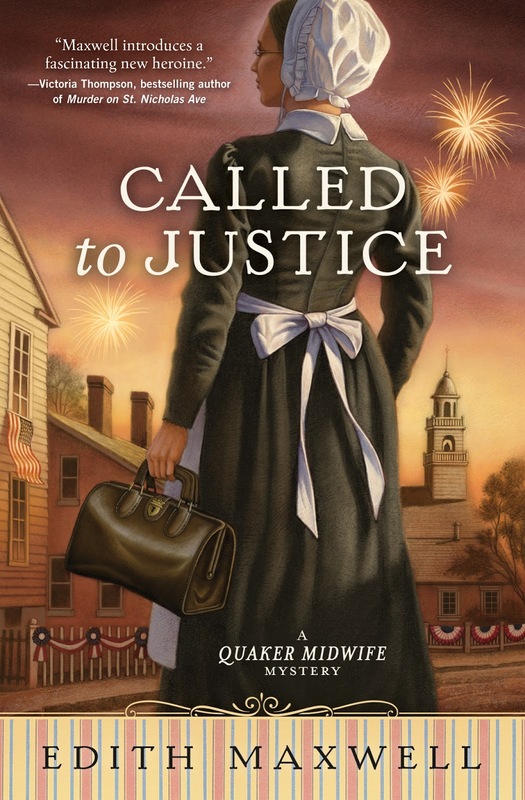 Laurie, you are the lucky winner of CALLED TO JUSTICE! Please send your mailing address to me at edith at edithmaxwell dot com. And congratulations. One of my favorite ways of transportation form another era is the street car and the train. I know we obviously still have both of them, but we don't use them for every day transportation anymore( in a lot of places). Thank you so much for the chance to win! This series looks fantastic. I would love to be able to travel like on Star Trek on a transporter. Laurie I is the lucky randomly selected winner. Congrats, Laurie. I wish I had a copy for everyone!